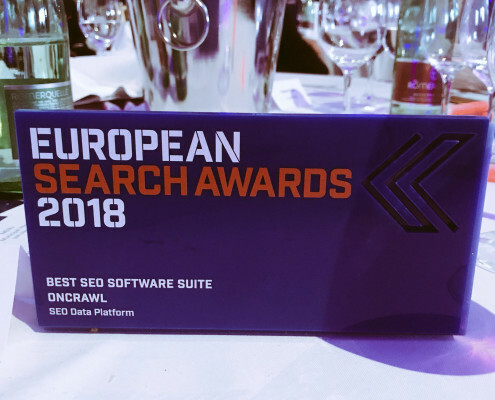 Bordeaux, France May 24th – OnCrawl, the French solution dedicated to SEO performance optimization, has won for the second consecutive time the Best SEO Tool Award at the European Search Awards. The European Search Awards celebrate the best of the search marketing industry every year by rewarding agencies, software publishers and industry personalities for their results, campaigns and innovations. The event, held in Praha, Czech Republic for its seventh edition, received a hundred applications for a total of 29 categories. OnCrawl was this year listed in three different categories: Innovation Software, Best Search Software Tool and Best SEO Software Suite. By 2017, the SaaS-based crawl and log analysis solution had already won the Best Search Software Tool award. This year, it is for the Best SEO Software Suite that it was rewarded against Botify and ScribbleLive | Linkdex. “The judges were impressed with their fast and continued growth. They had an accurate SEO strategy which has clearly paid off. OnCrawl deserve true recognition for this entry, well done!” shares Don’t Panic Event, the organizing company behind the event. The solution’s success depends in part on the technical teams’ ability to deliver updates and new features on an almost monthly basis. OnCrawl has been built on a powerful data platform, providing real-time analysis, storing large volumes of data for historical analysis. OnCrawl now processes over 200 million URLs per day and over 100 billion log lines per week. “We are very proud to have won this award. This is not only a recognition in front of our peers but also a strong signal we want to send to the market. We plan to continue developing our offering and releasing new features in the coming months,” said François Goube, CEO and founder of OnCrawl. The tool recently took a new step by combining crawl, log files and Google Search Console data to create OnCrawl Rankings, an innovation that once again won it the award for best SEO tool in Europe.